Gravesite visit at 1:30 does not require a ticket. Public is welcome to lay flowers and stars. A short poetry reading and musical selection. If you wish to purchase only The Glass Universe, you may do so here. We appreciate your purchasing from us as net proceeds will be applied to the costs associated with this statewide event. Your support of the arts is appreciated. All books purchased can be signed by the author and picked up when she arrives in Dover at Parke Green Galleries. These will make a wonderful gift for anyone who appreciates history and the accomplishments made by women in science. We are honored to help bring Dava Sobel to Delaware so that she can share with all of you the experience of researching and getting to know about Dover’s own, Annie Jump Cannon. A portion of the funding has been provided by the Friends of Old Dover through a generous grant from the Delaware Humanities Forum. tOUR tICKET & bIRTHDAY pARTY pURCHASE. Annie Jump Cannon’s house was placed on the historic register in 2016 and is currently the home of Wesley College President and Mrs. Robert Clark. They have opened their home in the past to help us celebrate Annie’s birthday which is December 11 officially. We choose the Sunday prior to her birthday to celebrate, and this year the party and open house will be December 9, 2018 from 2 - 4. The Clark’s recently received Annie’s personal desk and visitors will be able to view it as well as meet Cannon Scholars at Wesley, the winner’s of the Mayor’s essay contest, and the writer Dava Sobel, who wrote The Glass Universe. 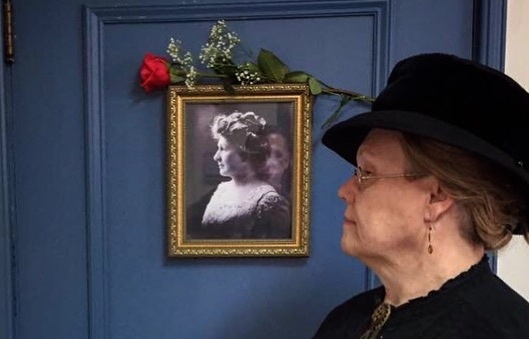 Prior to the house tour, we visit her grave at Lakeside Cemetery at 1:30 for a short ceremony which includes a reading and a musical selection. The grave visit is not ticketed. You will need a ticket for the house tour portion. Linda Chatfield will be in residence as Annie, Dava Sobel will be available to sign books, and birthday cake is by our French bakery, LaBaquette Bakery and Catering. For info call 302.674.1787.